To coincide with the U.S. release of its Madeira Cask 17 Year Old, Scotland’s renowned Speyside distillery The Balvenie held a series of launch events in key cities across the country. 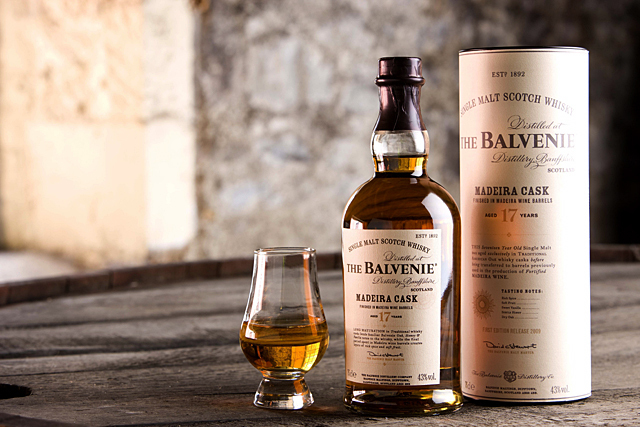 The Madeira Cask is the latest release in the Balvenie 17 Year Old Limited Edition Range. Each year, Malt Master David Stewart crafts unique 17 year old limited releases by finishing mature Balvenie spirit in various oak casks. Previous releases include: IslayCask (2001), New Oak (2006), NewWood (2006), SherryOak (2007), and RumCask (2008). 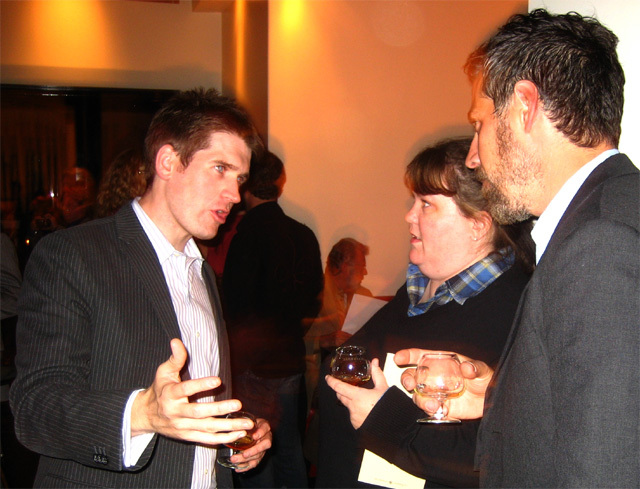 Brand Ambassador Andrew Weir (L) spreads the Balvenie gospel. In L.A., a launch party was recently held at Philippe by Philippe Chow. The informal event was hosted by Balvenie Brand Ambassador Andrew Weir, who mingled with guests and answered questions throughout the evening. The full Balvenie range was available for tasting, with stations arranged so that attendees could begin with the 12-year, move on to the 15- and 21-year, and finish with the star of the show, the Madeira Cask. Passed hors d’oeuvres were provided by Philippe and eagerly snapped up almost as soon as the servers left the kitchen. All in all, the evening was very enjoyable and educational. 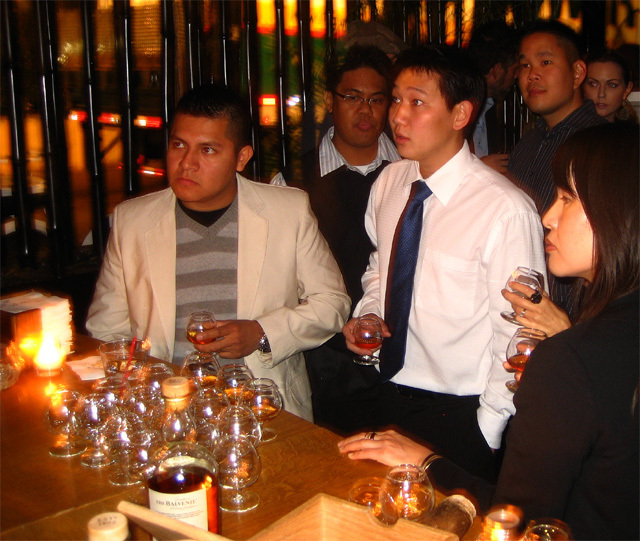 Guests ranged from whisky newbies to serious single malt enthusiasts, but everyone felt comfortable and conversation flowed as easily as the Balvenie. My knowledge and appreciation of the Balvenie’s limited releases was greatly expanded, and I’ll freely admit that I’ve been shamelessly dropping big Christmas gift hints ever since. Whether you’re gifting or receiving, the Balvenie is sure to please even the most discriminating of palates. Following are tasting notes and descriptions of the Balvenie range. Because of my eagerness to try the other releases, I skipped the 12 year old. However, it’s certainly well worth a try if you haven’t had it previously. No waiting for the 15 year old. The Balvenie Single Barrel is a 15 year old single malt which is drawn from a single traditional oak cask of a single distillation. Though each cask is subtly different, Stewart selects only those casks which the Balvenie Single Barrel essence, particularly honey, vanilla and oak notes. Nose – Fragrant aroma of vanilla, honey, and oak. Taste – Rich and complex, a sweet maltiness with vanilla, oak, and spice. Finish – Long and complex with a bit of licorice. The PortWood 21-year: a favorite stop for many guests. To create the PortWood 21 Year Old, the Balvenie is transferred to casks that previously held port wines. For me this was the highlight of the evening. Amazingly smooth and creamy, with a long finish. The PortWood was awarded a Gold Medal in the 2009 International Spirits Challenge and named Best in Class in the 2009 International Wine & Spirits Competition. Nose- Fruit and raisin notes, backed by a nutty dryness. Taste – Refined, creamy and silky with fruit, honey and spice notes. Finish – Long, gentle, nutty. 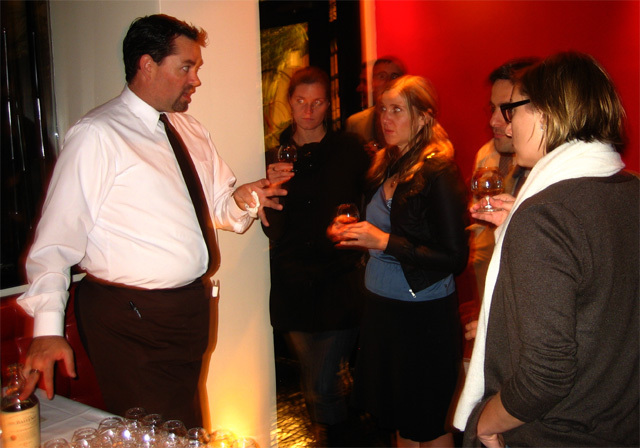 Guests listen and learn about the Madeira Cask. The Balvenie Madeira Cask was aged in traditional American oak casks before being transferred to barrels previously used in the production of fortified Madeira wine. Very spicy up front, with a long, dry finish. Nose – Spicy, earthy oak notes with subtle hints of vanilla and honey. Soft fruit aromas, with apple infused with cinnamon, ginger and nutmeg. Taste – Initial sweet vanilla oak notes, followed by spices and dried fruits (apricots, figs, dates). Finish – Long and balanced between sweetness and dry oak. For more information, please visit www.thebalvenie.com.